Excessive stress in cattle leads to reduced productivity, such as low liveweight gains, low conception rates, low milk yields, high pre-weaning mortalities and high susceptibility to disease. All animals have a large number of control mechanisms that maintain the steady state of the body and brain that is essential for life. Stress occurs when something in an animal’s environment (known as a ‘stressor’) causes an animal’s control mechanisms to become overtaxed so that they no longer work effectively and efficiently. The severity of the stressor, how long it lasts, whether the animal has time to recover from it before another stressor occurs and whether many stressors occur at the same time are all factors contributing to the effect of stress on the animal, and whether or not the animal is able to cope. The amount of stress experienced by an animal and its coping ability will also depend on the animal’s characteristics, such as its past experiences, state of health and nutrition, and temperament. Fear is a very potent stressor. Cattle have an innate fear of people that they have to learn to overcome. This fear will be reduced only if the interaction between an animal and a person is not an unpleasant one for the animal. This means that the interaction should not cause the animal unpleasant feelings, such as fear and pain. Research has demonstrated that livestock that are highly fearful of people are more stressed and have significantly lower production than those that are less fearful. Animals will also experience fear when they are confronted with new environments or situations because they have not been able to learn what consequences those environments and situations have for them. Again, experiences of those new situations should not involve fear and pain. The first experience of a place, piece of equipment or person is reported to be critical. If the experience is a bad one, then a permanent fear memory can be produced. Animals that have had a bad first experience in a certain place will attempt to avoid that place in future. Evidently, the greater the number of unpleasant experiences the stronger the learning and memory becomes. If, each time cattle are brought into the yards they are encouraged to move through the race by being hit with jiggers and pieces of poly-pipe, then they anticipate that future experiences in the yards will result in pain. They will learn this very quickly and will soon demonstrate their learning by a reluctance to enter the yards. If, on the other hand, being in the yards is a good or neutral experience, animals will quickly learn this and demonstrate their learning by willingly entering the yards. Yard-work can become a neutral or a positive experience for livestock if they do not experience undue fear or pain and if they are ‘rewarded’ with such things as water, shade, and some hay or other feed. People who yard-train weaners will recognise some of these aspects in that process. It’s also suggested that animals that have had a bad first experience with a person will be fearful of that person in future. Again, with repeated unpleasant experiences it becomes more likely that animals will generalise that all interactions with all people will be unpleasant. The animals become increasingly fearful of people and increasingly stressed by the presence of, and contact with, people. The animals would then have to learn to overcome the memory through many, many good or neutral experiences. This takes time and effort; it is far more efficient to give the animal a good or neutral experience in the first instance. This can be difficult to do, for example, if calves need to be identified (tagged) when they are very young. The first experience these young animals have of people is a very negative one, perhaps involving pursuit, restraint, fear and pain. It is recommended that young animals first experience people moving amongst them in a way that does not cause fear or pain. The usual situation when handling livestock involves unpleasant experiences for the animals. For example, they may be mustered and walked long distances to yards where they may be separated from group mates or mothers, run through races, restrained, and then, perhaps, be vaccinated, dehorned or castrated. However, it is reported that if the first experience is good or neutral then future unpleasant ones have less of an effect on fearfulness. When handling animals we should, therefore, be aiming to tip the balance of experience away from the unpleasant in order to reduce fear and stress. Doing this will also make the task easier for the handler, as the animals will be easier to move. A number of studies have shown that cattle with poor temperaments have reduced liveweight gains and feed conversion efficiencies compared to those cattle with good temperaments. Temperament is determined partially by an animal’s genes (it is inherited) and partially by experience (it is learned). Highly fearful animals (those that are nervous and flighty) are said to have ‘poor temperaments’, whilst those that are calm and docile are said to have ‘good temperaments’. Animals with poor temperaments are very difficult to handle and control, which has obvious implications for the welfare of the animals and the safety of the handlers. When handled, such animals behave in an erratic way and attempt to avoid or escape from the situation. This means that not only are they are more likely to injure themselves, but they pose a threat to the handlers. Handlers, in avoiding injury to themselves, may resort to using jiggers or to striking the animals in an attempt to move them. In this way a vicious circle is created; the highly fearful animal becomes even more fearful and behaves even more wildly and erratically! Many methods of mustering and moving livestock tend to use a fear response, so that the cattle move away from whatever is inducing the fear, e.g. noisy, fast-moving motorbikes and helicopters. Fear, however, can make cattle behave wildly and erratically and difficult to control. Methods that exploit the natural tendencies of cattle result in more controllable responses from the animals, which make the task faster, easier and less stressful for animals and handlers. They perceive humans (and dogs) as potential predators and have an innate fear of them. When a potential predator is first detected they will stand and turn to look directly at it. This is because their peripheral vision (that at the edge of their visual field) is not good at determining detail (it is excellent for detecting movement) and so they have to focus on an object by looking directly at it. They are unable to see an object or person directly behind them because of their ‘blind spot’ (diagram 1). They will maintain a certain distance from potential predators, which is the so-called flight distance or flight zone (diagram 1). Being herding animals they will bunch together rather than scatter in the presence of a potential predator. Low stress stock handling is a method taught by Bud Williams, a well-known and respected livestock handler from the USA. The method aims to achieve what is called ‘good’ movement. Good movement is when animals are moving smoothly and are all heading in the same direction (such as when cattle walk to water), and it encourages other animals to follow. ‘Bad’ movement prevents animals from following and is shown when animals are hesitant to move, start to turn away from the desired direction of travel and/or attempt to circle or cut back. The basic principles described below apply whether you are moving individual animals or groups. The method works best with animals that have a fairly large flight zone, as it is difficult to produce the desired predator avoidance behaviours in tame cattle. Apparently, it is also difficult to apply with pure-bred Brahman cattle, as these animals respond much better to following a leader. However, it is reported to work with Brahman cross cattle. The technique is easy to learn if you have patience and take your time. Animals that are handled quietly and calmly on a regular basis learn that the handler(s) will not pressure them so hard as to cause fear and panic. So, each time you work your animals in this way you are training them to have good movement and be easy to move. The low stress, therefore, not only applies to the animals, but also to the handlers! There are a number of steps in achieving good movement and these will be explained in order. When approaching animals the aim is to get them to move away from you slowly and calmly; animals that gallop away are difficult to control. When you first approach animals you need to watch for a reaction from them. When you get a response (for example, they stop doing what they were doing and look at you) you need to be aware that you are approaching the edge of the animal’s flight zone (diagram 1). Entering the animal’s flight zone puts ‘pressure’ on the animal. Not all individuals will have the same flight distance, so when you approach a group you will need to watch for the ones that are particularly fearful, as they may gallop off if you get too close. If you are approaching from the front, do not approach animals head-on, as this may cause them to panic and run, or to stand their ground. Do not approach animals from directly behind them as this will cause fear because the animal will either suddenly see you, or suddenly lose sight of you, as you will be in their ‘blind-spot’ (diagram 1). This will cause the animal either to turn to try to see you, or to run away. It is alright to move through an animal’s blind-spot, but you should not remain there more than momentarily. When pressure is applied to animals it must be released, either by the animal moving forward or the person moving back. Make sure you relieve the pressure on the animal once you get the desired response. Constant pressure with no release causes animals to panic, because they feel trapped, and this means you lose control of them. You should work at the edge of the animal’s flight zone because it is easy to apply and release pressure in this area (by moving into and out of it). This method will keep the animals calm, making moving them much easier. Pressure should be applied from the side and towards the front of the animal (shoulder) or the front of a group of animals. Each animal has a point towards which pressure should be applied. This is termed the ‘point of balance’ (diagram 1). Cattle will move forward if the handler stands behind the point of balance. 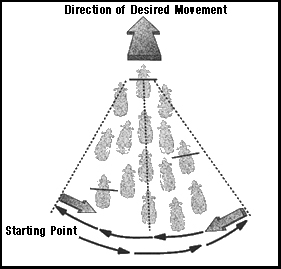 Moving forward allows the animal to move away from the pressure, and in a group, movement of the front animals leaves room for the back animals to follow the others. If you pressure an animal that is at the back of a group there is nowhere for it to go, so it will try to cut back. Pressure should not be applied from directly behind an animal because (a) you will be in its blind-spot, so it will tend to turn to try to see you and (b) if the animal moves forward, so will you, which means that the pressure on the animal is not being released. Loud noises cause excessive pressure, so it is important to stay quiet when working animals. You should locate the majority of your herd and work with that group. Making a series of wide back and forth movements on the edge of the herd will start the animals loosely bunching together. You should not circle around the cattle, but move in straight lines or a very slight arc (diagram 2). 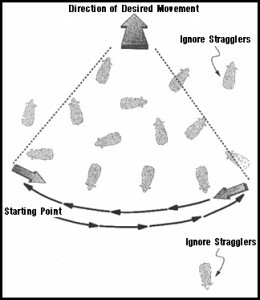 Stragglers that are off to one side will join the others, and any hiding in scrub or timber will be drawn out because they seek the safety of being in a herd. It is important to allow the animals time to form this loose group, particularly when mustering mothers and calves as it allows time to mother-up. If animals are pressed too hard at this stage they can panic and run. Once loosely grouped, pressure can be applied at the edge of the group flight zone. If you are too far away, animals will tend to turn to look at you, so you need to get closer to them. Again, this is achieved by moving from side to side in straight lines, angling your approach so as to get closer (diagram 3) and cause forward movement. It is important to remember that when an animal or group responds to the pressure then the pressure must be relieved; you must stop your forward movement, or must change your direction of movement. This rewards the animal for moving in the desired direction. When the desired movement slows down, apply pressure again. If animals turn and attempt to cut back it is likely to have been caused by the handler entering the flight zone too deeply. At the first indication of turning back, the handler should back-up and increase their distance from the animals. Surprisingly little detailed information is available on how handlers control the direction of movement of animals. The position and angle of approach of the handler to the animals are critical in determining the direction that the animals will move. Handlers need to carefully observe the animals, as their responses will tell them whether or not they (the handlers) are in the right position to achieve the desired direction of movement. Diagram 4 shows the handler movement patterns that are reported to keep a herd moving in an orderly way, and is said to work along a fence or in the open paddock. 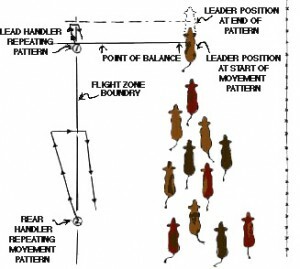 If a single handler is moving the animals then position 2 on the diagram should be used. All the animals in a group must be moving in the same direction before you attempt to change the direction of that movement. It is reported that, with good movement away from the handler, control of direction can be achieved by the handler simply moving to the left or right; moving to the left (putting pressure on the left ‘corner’ of the mob) will make the cattle turn right and vice versa. When controlling direction, the aim is to try to work in a ‘T’ to the way you are heading (diagram 5). The top of the ‘T’ should be parallel to the animals you are moving and the handlers must stay in a straight line along the top of the ‘T’. If the handlers at the edge of the group move forward off the line, they put too much pressure on animals in front of them. This will cause the animals to turn around and perhaps even attempt to cut back. Moving parallel to animals in the same direction that they are moving will tend to slow down the animals. This can be useful if you are trying to settle animals that are moving too fast. Moving parallel to them in the opposite direction to the way they are moving will tend to speed them up because they will try to hurry past you. This principle can be used for working animals in the race. When the handler is deep within their flight zone (as they tend to be when working animals in races), animals have a tendency to move in the opposite direction to the handler. So, walking towards them will encourage them to move forward. These handling principles apply regardless of the mode of transport, that is, whether you are on foot, horse or motorbike. However, a change of mode will be something new to the animals and is likely to cause a heightened fear response. Therefore, animals are likely to have a greater flight distance until they become accustomed to the new mode. Evidently, this needs to be taken into consideration. Also, your speed of movement will affect the animals’ response. So, if you are moving fast on, say, a motorbike, you should be working the animals from much further away than if you are on foot. Riding ‘figures of 8’ is a good method of working with a motorbike, as this is like walking or riding a horse back and forth. It is important to get animals accustomed to all methods. Animals that have never experienced a person on foot can be difficult to handle and become stressed if they enter a feedlot and when they get to the abattoir. Pre-slaughter stress is known to cause meat quality problems, such as dark cutting. Dr Carol Petherick, formerly The University of Queensland, Queensland Alliance for Agriculture and Food Innovation.